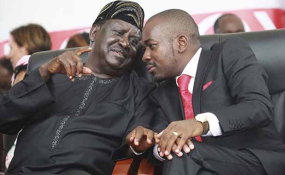 If Nelson Chamisa goes ahead, he will join the ranks of Kenya’s opposition leader Raila Odinga and Uganda's Kizza Besigye (file photo). "Chamisa is breaking the law and he might get arrested," he said. "I urge law enforcement agents to protect the people because it is a national security matter. I understand that when one loses, you certainly go through a phase in which some of it requires psychiatric attention. It is not easy. "There is a depression which one goes through. He needs help right now from a psychiatric point of view. I do not understand why people would go and say we are being sworn in. In which government will they serve and what will they do unless if he is going to swear-in shadow ministers?"